What to do in Berlin in 2012? Happy new year to all our friends from all over the world! A lot of great parties and exhibitions are awaiting us in Berlin in 2012. We have listed up some of the finest upcoming events. Read on and plan your trip to Berlin! The Long Night of the Museums, on January 28th. collections and art objects throughout the night, enriched by a variety of events. transmediale is preparing to get in/compatible in 2012. The theme in/compatible probes the artistic imagination that is developed in a network culture where everything seems to connect, but not all fits in or works together. Under this festival theme we will present a diverse international programme: a two-day thematic symposium, a curated exhibition, an extensive video programme and a performance series which includes the legendary Joshua Light Show. Another highlight is the launch of a new project platform, the reSource for transmedial culture, which will present itself through an experimental programme of workshops, open discussions and performative interventions. The occasion of the 25th anniversary of transmediale will be marked by special screenings and panel discussions. On top of all this, we are partnering up with CTM for a festival Vorspiel consisting of partner events spread all over the city in the weekend immediately preceding our opening. complementary relationship between the two exhibition spaces. elements. It is the artist’s first solo exhibition in Germany. concerts and installations into an intense experience for the audience. contemporary music festival of the Berliner Festspiele. Hauptstadtkulturfonds. With thanks to Gallery Koyanagi, Tokyo. Horstkrzbrg, on January the 6th. Zeitgeist Sessions takes its winter refuge at Horst Krzbrg! For the twelfth day edition we have Kingdom (Night Slugs/Fade to Mind) and C.R.S.T. (Well Rounded/Ten Thousand Yen) joining us. spiced with lots of Future Garage for the new year to come! up, taking you on a musical trip through the depths of the subfrequency styles. Season’s Greetings from Zeitgeist Sessions! This thursday, great live music at the White Trash Fast Food! Starts at 8pm. Also go here for fantastic fast food!! Cowboy Club, just around the corner from the EastSeven Hostel!! The band is called Django Lassi and they play gipsy swing music! check it out! permanent exhibition in newly renovated rooms purposefully allotted to its collection. illustrated through a range of objects taken from various Muslim sources. 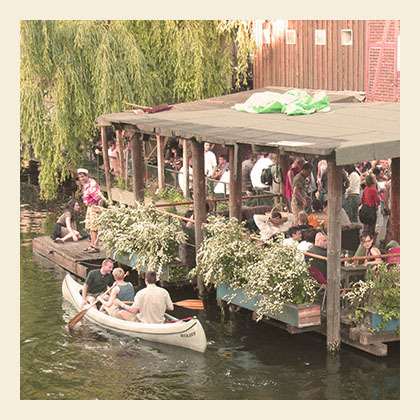 Check our weekly Berlin Hostel Blog to read about events and parties in Berlin!